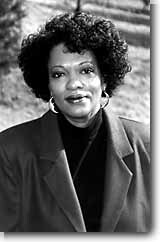 RITA DOVE is Commonwealth Professor of English at the University of Virginia in Charlottesville and served as the Poet Laureate Consultant in Poetry between 1993-1995. She was the youngest person -- and the first African-American -- to receive that honor. While Poet Laureate, Ms. Dove brought a program of poetry and jazz to the Library's literary series, along with a reading by young Crow Indian poets and a two-day conference entitled "Oil on the Waters: The Black Diaspora," featuring panel discussions, readings, and music. As she accepted the Laureate position she noted that, "If only the sun-drenched celebrities are being noticed and worshiped, then our children are going to have a tough time seeing value in the shadows, where the thinkers, probers and scientists are who are keeping society together."